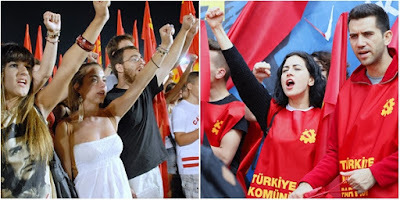 In Defense of Communism: KNE sends message of solidarity to TKG: "Hands off the Communist Youth of Turkey"! KNE sends message of solidarity to TKG: "Hands off the Communist Youth of Turkey"! Regarding the recent attack of fascists against members of the Communist Youth of Turkey (Türkiye Komünist Gençliği-TKG) who were distributing anti-NATO leaflets at Istanbul University's Beyazit campus and the subsequent arrest of comrades by the police, the Central Council of the Communist Youth of Greece (KNE) issued a statement of solidarity towards TKG. Among other things, the statement highlights the political activity of the Communist Party of Turkey (TKP) and its youth (TKG) in universities and schools "despite the continuing surveillance of its members by security forces and the police". "It is obvious", points out the statement of KNE, "that the bourgeois class, the state and its parties are disturbed by the acceptance and support of the positions of the TKP and TKG by the Turkish youth. They have been disturbed because neither the emergency security measures nor the intensification of repression, the environment of terrorism and the arrests have succeeded to prevent the young communists from the development of mass and militant activity". "For that reason", reads the statement of the Greece's Communist Youth, "members of fascist organizations, who act in support or even in collaboration with the police, have been "recruited" thus fulfilling their role as watchdogs of the system against peoples' interests". "KNE condemns the repression and attacks against the TKG. The escalation of the state and other mechanisms comes in a period when the Turkish bourgeois class attempts to upgrade her role in the region, from the Balkans to the Middle East. It is once more proved that the attack on the people's living standards and rights, the dangerous war plans and the competitions of the bourgeois classes to strengthen their position in the region go hand by hand with anti-communism, the intensificiation of repression against the workers-people's movement and its vanguard, the communists". "Faithful to the principles of proletarian internationalism we will continue the coordination and the common action with our TKG comrades. The neighboring people have nothing to devide, on the contrary they have as a common opponent the system of exploitation, of poverty, of unemployment and imperialist wars. They have common interest to fight against the imperialist war, against the USA-NATO plans in the region, against the effort to dispute the borders". "Against the nationalist and irredentist propaganda that is developing in Greece and Turkey", writes the KNE statement, "the struggle for peace, friendship and solidarity among our people must be strengthened".